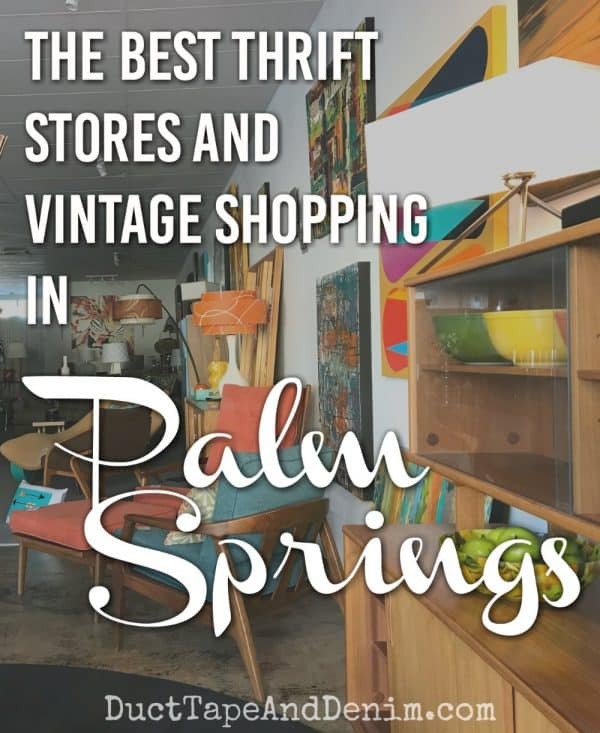 The Best Palm Springs Thrift Stores & Vintage Shopping in the Desert! So… how do you feel about midcentury modern? Seems like people either love it or hate it. Our home isn’t completely one style… we’re a little eclectic. But I do like to add in some “mid mod” elements so we had a great time window shopping on our trip to Palm Springs. I even came up with a list of Palm Springs thrift stores to hit if you’re planning a trip there. Dazzles, 1035 N Palm Canyon Dr, Palm Springs. Great place to look for mid-century mod! A little pricier than the usual thrift store but after all… you’re in Palm Springs. What do you expect? They have a great selection of glassware, costume jewelry, rattan decor, vintage ice buckets, furniture, art, and more. Even the thrift stores have beautiful locations in the Palm Springs area. Angel View Thrift Shop. Several locations in the Palm Springs area. Used furniture, books, housewares, dishes, and more. Angel View Prestige Boutique has some amazing, high quality, and vintage clothing and home accessories. Revivals. At least 5 locations that I know of in the Palm Springs area. They get fresh merchandise daily so check back often and sign up for their newsletter so you get notification of their regular 50% off sales. The POP Shop, 551 Industrial Place, Palm Springs. POP = “previously owned products” I thought this was a cute name. They have furniture, home decor, clothing and accessories, records, and more. Don’t cha love those palm trees? Goodwill. 3 locations in Cathedral City, Rancho Mirage, and La Quinta. Just like your normal Goodwill… but with a little more desert style! Nu 4 U Thrift, 69550 Hwy 111, Rancho Mirage. Jackie Lee’s Thrift Shop, 2800 E Alejo Rd, 9. Bazar, 125 E Tahquitz Canyon Way, Palm Springs. Desert Best Friends Closet. 74040 Highway 111, #F, Palm Desert. New Life Resale Boutique, 2 locations. Southwest Church Thrift Store, 3 locations, Bermuda Dunes, Palm Desert, and Indio. Sunny Dunes Antique Mall. Like most antique malls, you’ll find a huge variety here. The Frippery, 664 N Palm Canyon Dr, Palm Springs. Used, vintage, and consignment clothing including mod, resort, bohemian, and more. Mitchell’s Palm Springs. Specializes in vintage and new clothing. Iconic Atomic, 1103 N Palm Canyon Dr, Palm Springs. The Fine Art of Design. 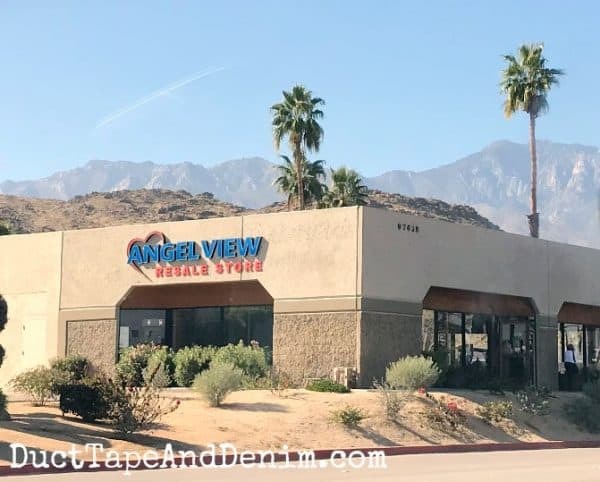 73717 Hwy 111, Palm Desert – Amazing high end vintage clothing. One of my thrift store tips is to shop in upscale, established neighborhoods. Palm Springs fits that to a T! There’s a lot of expendable income in this area and some residents redecorate every couple of years. You’ll find some great, high-end and vintage furniture here. Consign Design, 72171 CA-111 #100, Palm Desert. The Furniture Exchange, 68929 Perez Rd, Cathedral City. Lots of used and vintage home furnishings. Some have only been used to stage homes. Modern Way Palm Springs, 745 N Palm Canyon Dr, Specializes in Midcentury Modern furniture and home accessories… exactly what you want to find in Palm Springs! You’ll often find rare pieces here. Spaces, 68929 Perez Rd, Ste K, Cathedral City. 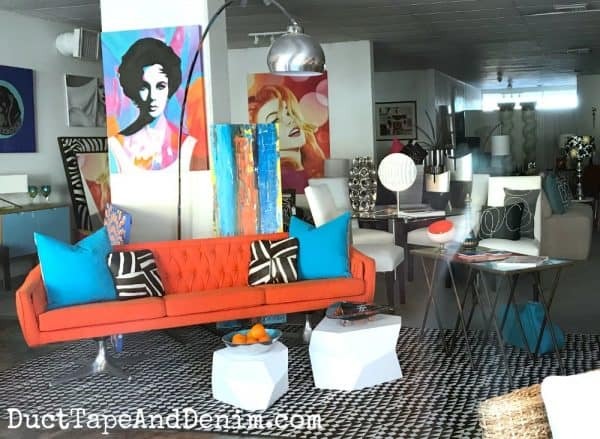 “An eclectic collection of all things modern.” Specializes in mid-century, modernist, Brutalist, and Hollywood Regency. Thanks for reading my list… now leave a comment and let me know your favorite Palm Springs thrift stores or vintage shops.